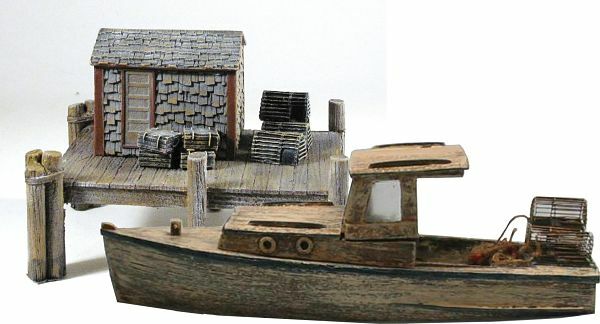 Follow along as I build the display model for the new HO 1:87 Scale Lobster Shack Kit from Frenchman River Model Works. This kit is simple and fun to build. In addition I will be exploring some easy to replicate painting and detailing techniques using Dr. Ben’s Scale Consortium products which are also available at frenchmanriver.com. 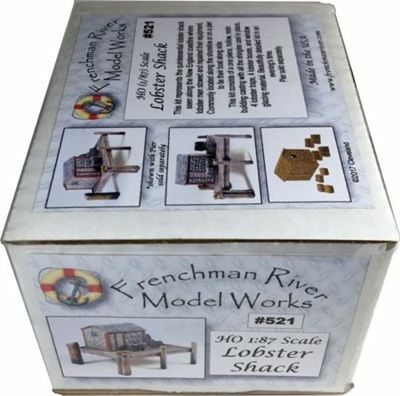 When you order the kit #521 HO Scale Lobster Shack from Frenchman River Model Works, this is what you will get in mail. And here are the Doctor Ben’s Scale Consortium products I used. And after you unpack your box you will have these parts that come in the kit (*not pictured is the laser cut window glazing material). 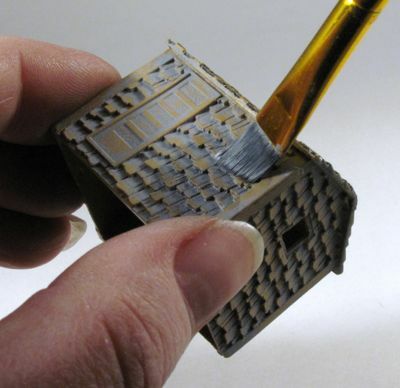 To begin, we recommend washing the resin castings with warm tap water and Dawn dish detergent scrubbing well with an old toothbrush to remove any residual mold release left over from the casting process. 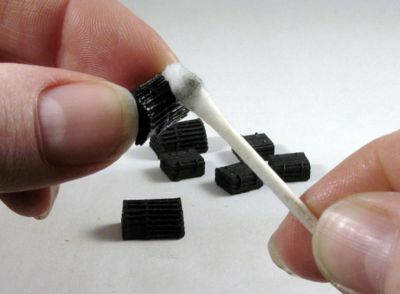 This is important when working with resin kits because the mold release is “oily” which allows the mold to release the new resin part during the casting process; however any “oily” residue left on the resin part interferes with good paint adhesion. No Bueno. That being said, I chose to skip this all important step and continue unhindered…living life on the edge. Allow the parts to dry thoroughly before proceeding. Next, I spray painted the lobster traps and boxes with the flat black paint spray paint and then used the light gray primer to spray paint the shack. Using a q-tip dipped in paint thinner, remove the gray primer on the raised areas to reveal the wood colored resin underneath. Don’t remove all of the gray, but just enough to add depth and variation to the wood allowing it to appear “weathered”. Repeat the process with the lobster traps and boxes. There may be some “flash” left over from the casting process. 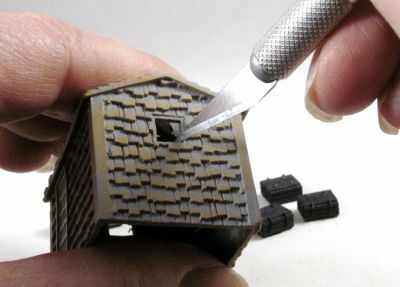 It’s usually very minimal and easy to clean out with an x-acto knife. Easy Cheesy! 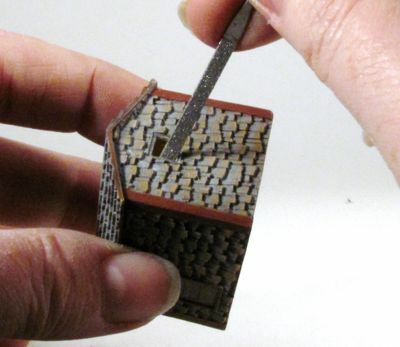 To finish painting the shack, traps and boxes, I used a line of products by Doctor Ben’s Scale Consortium. Many of you are familiar with these products, but if you’re not, I highly recommend that you give them a try! Of course, we do sell them for the convenience of “one stop shopping” (shameless plug here), but I urge you get them wherever you can. Seriously a great line of products! Also, they last most of forever since a little goes a long ways. 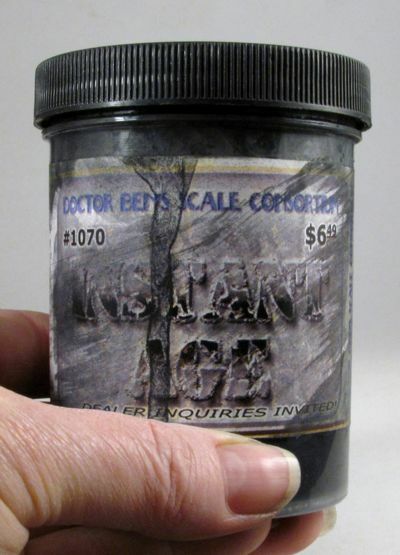 This jar of Instant Age has been kicking around our shop for quite a while and been used on numerous projects! I’m going to pause a minute here and explain what the weathering solutions are and how they work. I’m thinking this may be a topic for a future article, but for now, here goes. For those of you familiar with the product feel free to skip ahead (I won’t mind) and those of you that haven’t tried them and wondering what the heck they are, read on. 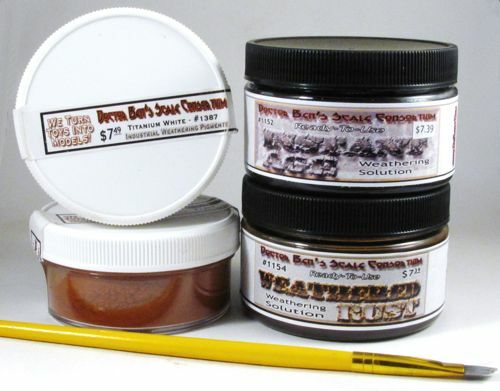 There are several lines of weathering/coloring products from Doctor Ben, but I’m going to focus on Doctor Ben’s Scale Consortium Weathering Solutions for now. They come in a nice range of colors that should meet most of the weathering needs for almost any situation you’ll meet in your modeling endeavors. The product consists of pigments in an alcohol base. They are not well mixed in which ends up being a great thing as the pigment settles into a thick layer on the bottom of the jar. 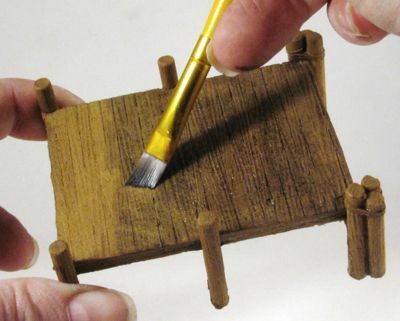 Using a popsicle stick (or craft stick or a brush even) you can “pull up” and mix the pigment into the solution to suspend as much or as little as you would like. In other words, for a lighter “wash” mix in a small amount of pigment and for a more concentrated application mix in a lot. It’s totally customizable to your intended results…oh, and did I mention that it’s really easy to fix any oopsies? All you need is a q-tip (or paper towel or rag will do) dipped in rubbing alcohol to wipe away anything that you regret…ahhh, if all things were this easy to fix right? And when the alcohol eventually evaporates and you have powder left in the bottom, never fear, all is not lost! Simply pour in some more rubbing alcohol and, Voila! You’re good to go again! Using a paint brush (I’m using an angular flat, but really, just use what you have on hand that works) dip the bristles into the instant age weathering solution that you have mixed to achieve the amount of coverage desired. I used a lighter mix since I just want the black to settle into the details and bring out the wood grain and shingle detail. Something to keep in mind is to hold the building upside down so that the wash settles and stays where the shingles overlap to achieve the best results. Let this dry. If you need more definition, then try applying the Instant Age wash with more pigment mixed in. If it’s too dark, use a q-tip, dipped in rubbing alcohol and wipe some black off. Totally fool proof! When you’re happy with the results, you’ll want to seal the instant age by spraying with an acrylic sealer. Any further alcohol based washes will disrupt this effect which can lead to much frustration. Ask me how I know. My favorite way to use these pigment powders is to dip my brush in rubbing alcohol, then into the powder and then swirl it around in the inside of the lid to make a nice paint that is very concentrated. This time I’m using a rigger or liner or detail brush…many names for this type of brush. Long story short is that it is fine enough to give you the ability to paint fine details. Using the brush, paint the trim on the lobster shack whatever color you desire. In my example, I’m using the red. 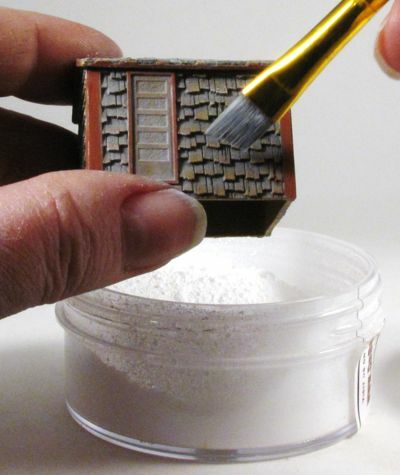 Now, grab the Doctor Ben’s Industrial Pigments in Titanium White and dip your dry brush into the powder, tap off any excess and then wipe good on some paper to really get any extra off and carefully and lightly dry brush the white over the details on the shack. This is a very concentrated pigment and will be way too much really quick, so start slow. You’ll know it’s perfect when the details just pop without ruining the colors. One thing to keep in mind is that when you spray the shack again with the acrylic spray the effect will be slightly dulled, so you can over shoot this step a bit. Next, test fit the windows to the openings and file the openings a bit with a flat file if needed. We simply love using Pic’n’Stic to help us place windows. This is a stick that has a wax end that is tacky enough to temporarily stick to the window glazing material and holds it in place while you glue around the edges with CA glue. Glue the windows in place using CA glue which is also available at Frenchman River. When you order the Kit #191 Multiscale Pier, you will receive the full sized pier. We wanted to scale down the size of the pier, so we cut it to size. The remainder is easy to fit in to another area effectively giving you 2 piers for the price of one. Wooo-hooo! Who doesn’t appreciate a BOGO deal? 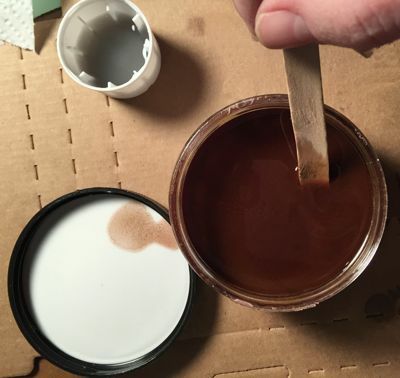 We use a wood colored resin on our “wood” kit parts and this is one place that this base color is a huge asset in the painting process. 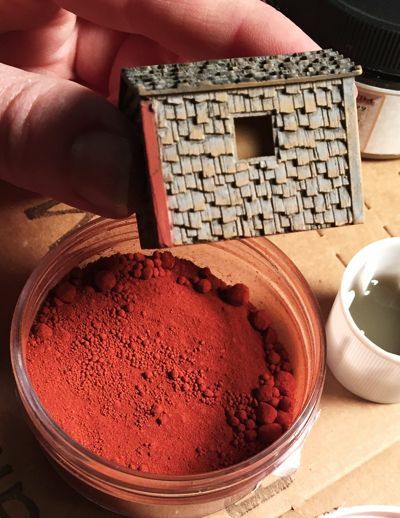 Use Doctor Ben’s Weathering Solution in Weathered Rust…yes, I know, we’re painting wood here, but the weathered rust color is perfect over the wood colored resin and totally easy! Mix a medium amount of pigment into solution and use a brush to apply a nice coat of darker brown. Allow it to settle into the details, brushing it around until you have a uniform color that you’re happy with. You can either apply this a bit darker on each leg to simulate the high tide line or use a bit of the Instant Age. Now dry brush a small amount of the titanium white to pick up the edges and details. Once you get the hang of this it becomes second nature to see where to apply the white to make all the details pop. Repeat on all of the lobster traps and boxes that you painted earlier. Give each piece a coat of Matte Acrylic Spray to set all the pigments and arrange everything to suit. And, while I’m at it… Frenchman River also has an HO Scale 34’ Lobster Boat (kit #91) to complete your vibrant lobster industry scene! 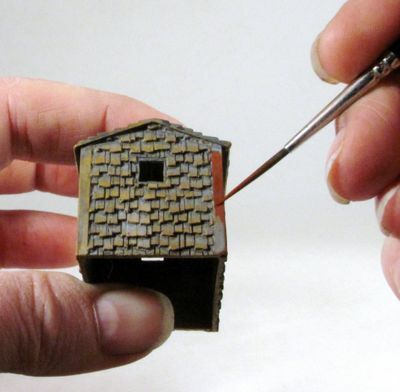 I hope you’ve enjoyed this article on building and painting the HO Scale Lobster Shack and hopefully picked up a few tips or at the least were mildly entertained!